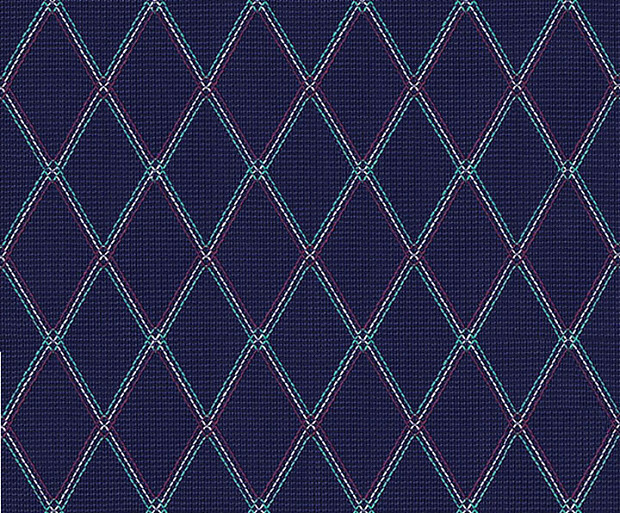 Vox Valvetronix Blue Diamond Grill Cloth - ~15.75" tall x ~29" wide - Ideal for AC-30 sized amps - Navy blue background with red, white and green cross stitched diamonds. This cloth was used on the Vox Valvetronix AD60VT, AD60VTX, AD60VTH, AD120VT, AD120VTX, and AD120VTH amplifiers that Vox produced from 2001 through 2005. This cloth was also installed on the Vox AD212 and AD412 speaker enclosures. When you purchase Vox grill cloth from North Coast Music, we cut around and discard sections of the fret cloth that have what we deem to be significant blemishes, pulls, or defects. Others just cut the cloth from a bulk roll, and any defect in that fabric is simply sent to you.